Extract from Sir William Young's 'Almanac for the Island of Tobago in the year 1810.' Young was the Governor of the Island from 1809 until his death in 1815. Here he has listed the wealthiest and most powerful residents on the island. 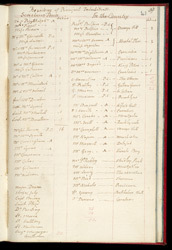 He records who lives in the town of Scarborough, as well as noting those who live in the surrounding countryside along with the names of their estates. He has also noted how many women were resident on the island.